Bookmark and WordPress are two quite different web building platforms, which allow creating quality projects with decent performance. The services use versatile approaches to the process of website creation, even though, they have one common goal – to help users with diverse web design background create and manage professional websites. The platforms offer an extensive feature set and advanced tools to ensure the unsurpassed web building experience. Bookmark – is a cloud website builder, which can boast an advanced AI tool. The service is intuitive and user-friendly. It has modern innovative look and logically-structured interface to be understandable for newbies. WordPress – is a world-famous platform that does not require any presentation. This is the Content Management System, which was initially launched as a blogging platform, but is now applied for various web building needs. It seems a bit weird to compare WordPress vs Bookmark at first sight. This is because the systems are quite different, when it comes to the ease of use, functionality, web design approaches, techniques and tools used. At the same time, this comparison may be of great interest for beginners and web design pros looking for a decent and full-featured service to start their projects. It is high time now to review both systems in details to compare their feature sets, ease of use, convenience and efficacy. Let’s get started! Bookmark. The website builder is quite easy to use as the system provides you with understandable and detailed instructions. Registration takes a few minutes only – Bookmark allows signing up for the service via Facebook and Google+ accounts. As soon as you are done with that, you can proceed working on your website development by making use of the advanced AIDA tool, which is definitely the highlight of the system. AIDA is the Artificial Intelligence Design Assistant, which easily guides you through the web building process and automatically designs a website for you based on the information you submit. The dashboard of the website builder is simple and stylish as well. Even a newbie can understand the implication of the majority of settings with ease. As a result, this cuts down the web development time and guarantees the required result. WordPress. This is the open-source software, which looks comparatively simple at first sight, but may cause problems, when it comes to the process of website creation. The CMS requires specific preparation to the web design process and it’s almost impossible to go without programming knowledge here. As a result, it takes more time to cope with the web design process and complete a decent project with WordPress. The system is known for its plugin integration options, which make it possible to create almost any type of project, giving it advanced functionality. The prevailing amount of plugins is available on the web, even though, the system has its own integrated plugin collection. The same is about templates. You can come across multiple themes available on the web, which are mostly developed by third party users and can notably contribute to your website design and performance. Bookmark vs WordPress. It is simpler and more convenient to use Bookmark as compared to WordPress. The website builder is intuitive, user-friendly and flexible. You don’t have to be a pro to create appealing projects with it – the Artificial Intelligence tool brings the web design hassle to the minimum. As to WordPress, this is a Content Management System and this fact speaks for itself. The platform is more difficult to master as it requires web design background and sometimes even coding skills. It also requires additional plugin integration for better website performance. Thus, this is a more complicated tool for inexperienced web designers. Bookmark. The website builder offers an impressive feature set needed to launch and manage a decent website. As soon as you get to the working area of the system, you will see that it is comprised of two parts – the dashboard and the website editor. In the dashboard, you can get access to your websites, their statistic data, system news, updates, notifications, tutorials and connection with the system experts. It’s possible to launch any number of websites here at no cost at all and switch between them, if you need to make any changes. The WYSIWYG website editor encompasses the settings that may differ based on the template you will go for. This is the place, where you can preview the website in different modes, select ready made content blocks and modules (either standard or eCommerce), store the downloaded files, adjust website design and settings etc. Bookmark also offers an advanced Focus feature, which comprises a set of uniquely designed and functional web page sections you can integrate into any part of your website with a few clicks only. 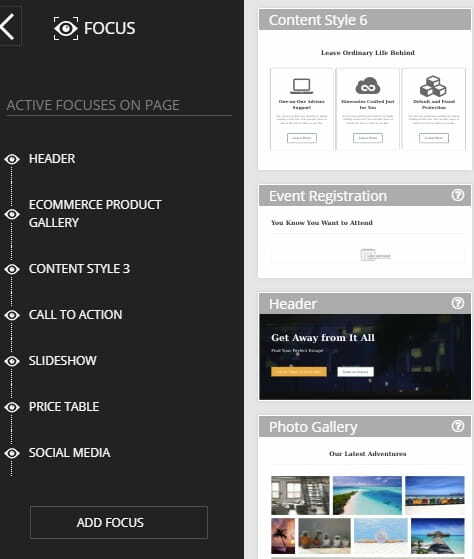 Each Bookmark template involves 20 Focus sections, all of which match its style and theme. 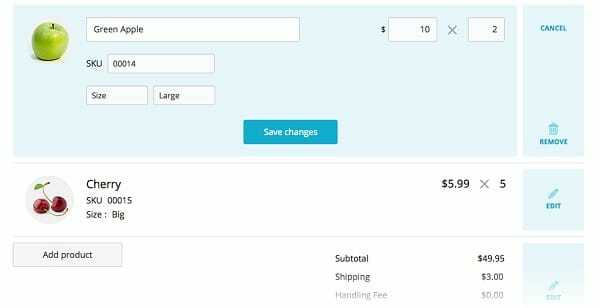 Bookmark’s eCommerce module makes it possible to create and manage an online store of any size you need to further sell the products on the web or via the social media. The highlight of the website builder, however, is its AIDA Assistant. This feature makes Bookmark stand out from the crowd as it excludes the necessity to possess web design skills in order to create a website. Instead, the system automatically does everything for you – starting from the template choice and up to the publication of the ready made project. What you need is to provide your own content and the system will generate a website for you. The entire process does not take it longer than several minutes, while the result is really stunning – you get a full-featured website in the amazingly short period of time. Isn’t that impressive? WordPress. The system comes with a broad range of design customizations tools and features, which make it possible to launch functional and attention-grabbing websites. The CMS was initially created as a blogging system and, thus, it can now be used to build different types of projects. It’s easy to upload and manage content here, but you should be ready to use coding skills, if you plan to create a full-featured website. If you lack this knowledge, it will take time and effort to get it. The platform’s functionality mostly depends upon integration options. The system has a number of built-in plugins and themes, which, however are not enough if you have an intention to get a large-scale project. To boost your website performance, you won’t go without downloading and integrating external plugins and templates. There are thousands of them on the web and many more are being developed by third-party users.Plugin integration is a surefire way to build customer trust and improve your website performance. But you should be really careful, when selecting them. This is because you cannot be 100% sure about the credibility of web designers, who created them. Thus, it is reasonable to opt for paid and safe plugins. What you should also remember is that plugin integration affects the frequency of website updates you’ll have to make. The more plugins you use, the more often you will have to update and manage your website. Doing this will be a challenge, if you don’t possess the required web design skills. Another important issue about WordPress flexibility is the need to purchase hosting. Unlike Bookmark with its integrated hosting, WordPress implies the need to select hosting on your own. Bookmark vs WordPress. Speaking about flexibility and feature set, we should constitute that Bookmark provides the entire functionality needed to launch a turn-key website right from the start. You don’t have to look for extra integrations out there – AIDA has an out-of-the-box functionality at hand. As to WordPress, it takes time and effort to master all its options and integration tools. Not all users are ready to do that because of the insufficient web design knowledge. If you still decide to try using WordPress, don’t forget about the increased fraud risks, which can eventually pose danger to your project. In case you don’t wish to risk, go for Bookmark as it is a much simpler solution. Bookmark. Unlike the majority of popular website builders, Bookmark doesn’t offer a standard design collection. This, however, does not diminish its advantages. It is AIDA, which does the entire website design process for you. You don’t need any templates or design customization tools to give your website the required look. As soon as you submit your business info and content, AIDA will automatically select the most suitable template for you to further fill it with related content. Templates AIDA createsare versatile and interesting – there are no two similar themes here as each template comes with its own structure and layout. The themes are responsive, which is a must for any modern website as well as for contemporary users. If you don’t like the template the platform offers by default, you will be able to ask AIDA to select another one until it offers the theme that ideally comes up to your needs. The entire process of website creation with Bookmark takes a couple of minutes only, while the system ensures safe and engaging web building experience. Although, AIDA creates website design in the automatic mode, it is also possible to make the required edits, if you have such a necessity. Just reach the Settings section in the dashboard and go ahead to edit the background, style and other elements of your project! WordPress. The CMS offers a collection of free and premium templates to match your style and topic preferences. These themes, however, are quite similar to each other. Fortunately, WordPress grants CSS file access to let you edit website design with regard to your needs. If you have enough programming knowledge and skills, you can change website titles, typography, style, color palette, background and other settings. It is also possible to surf the web and select custom made WordPress themes there to further integrate them into your website. Just like with plugin integration, though, you have to be very attentive to select safe and high quality templates that won’t pose danger to your website. Bookmark vs WordPress. When it comes to design customization, Bookmark is definitely the leader. You won’t have to worry about template customization at all here as the Artificial Intelligence tool with handle that for you. This is a notable advantage for beginners. WordPress is also good at design, but only for those users, who possess coding skills and can use these advantages in a proper way. Bookmark, in its turn, is also good at design. Bookmark. The customer support team of the service is available 24/7. To get in touch with them, you should either fill out a written form or use the live chat window. The latter can be found on all the pages of the system. Another way to contact the customer support service is to use the feedback form found in the “Help” menu. WordPress. This open-source CMS cannot boast any customer support at all. Instead, it has an extensive community of users, which is quite powerful and can provide you with all the answers to your questions. WordPress forums are available on the web and you can get all your inquiries handled there in the shortest time possible. WordPress vs Bookmark. Neither Bookmark nor WordPress offer extensive customer support options. However, those provided by Bookmark are more detailed as the system has a customer support team users can contact in several ways any time of the day. Bookmark. The website builder has a never-ending free plan If you need a full-featured website, you can choose between several subscriptions. These are Personal, Professional and Business plans. Their cost ranges between $4.99 and $24.99 per month based on the subscription and the terms it provides. The pricing policy is moderate and reasonable, when it comes to long-term web building goals. WordPress. The system itself is free to download for each and every user. This concerns the cost of website creation in general. To get a full-featured project, you’ll have to invest into premium themes, plugins and extensions. As soon as you are done with your website design, you’ll have to purchase hosting and domain name. Otherwise, you won’t reach decent result without these financial expenditures. Bookmark vs WordPress. When it comes to the price aspect comparison, Bookmark makes everything clear right from the start. If you need a simple website, then go for a free plan. Need a more complicated project? Go ahead to upgrade to one of the premium subscriptions. That’s simple. With a broad feature set, WordPress websites are usually more costly. Keep that in mind when making the final choice. Bookmark and WordPress are decent web building tools for users, who have an intention to create a full-featured, informative and scalable website with excellent design and top notch performance. The services, however, use different approaches to the process of website creation, which is eventually reflected in their characteristics, application sphere, parameters and degree of web design awareness. 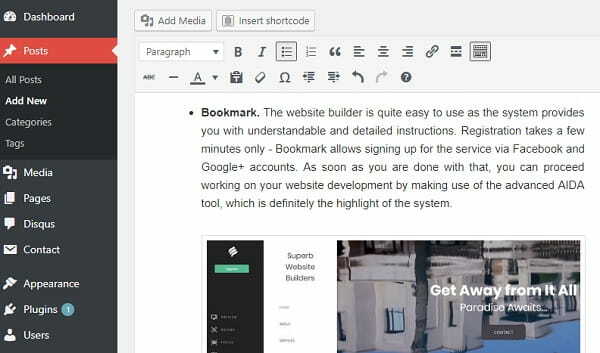 Bookmark is an intuitive website builder, which makes it possible to create decent websites due to the integrated Artificial Intelligence tool called AIDA. Building projects with the system is stunningly simple as it literally does this for you. WordPress is a renowned Content Management System, which works great for large-scale projects as well as for professionals. Newbies will find it difficult to master the system and create websites with it. You’ll also have to bother about hosting and domain choice, integrable plugins and templates for more effective SEO promotion, analytics set up and other suchlike nuances. To sum it up, both systems are worth the attention. They are decent competitors, which work great in their own niches. If you need quick yet quality result and cannot boast programming knowledge, then Bookmark is the best solution for you.